Discussion in 'GS Boxers' started by JimVonBaden, Feb 8, 2006. 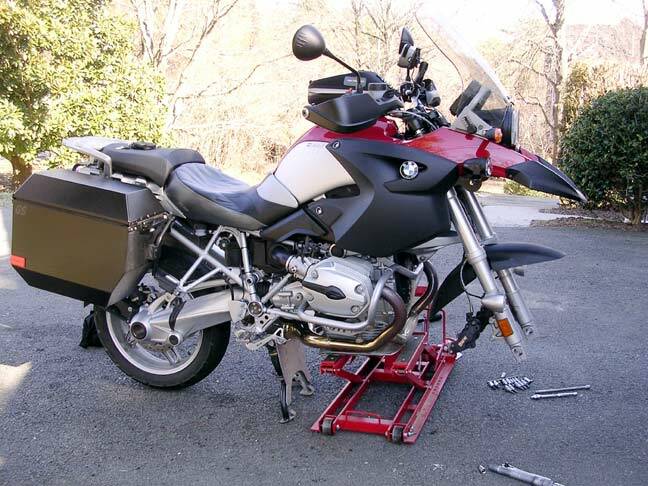 6700 miles, thats all I got from my R1200GS Dunlop D607 Trailwings, also known as Deathwings. I have to say, from the beginning I wasnt at all impressed by the handling, off road grip (or total lack of) and the noise. The tires were loud, and wore very quickly. I got 14K out of my Tourances on the heavier 11GS, so I was hoping for at least 10K from these, but no dice. I installed a set of Avon Distanzias. I had them on my 11GS and really liked them. Front tire off, and the bike supported by my $39 PepBoys bike jack. 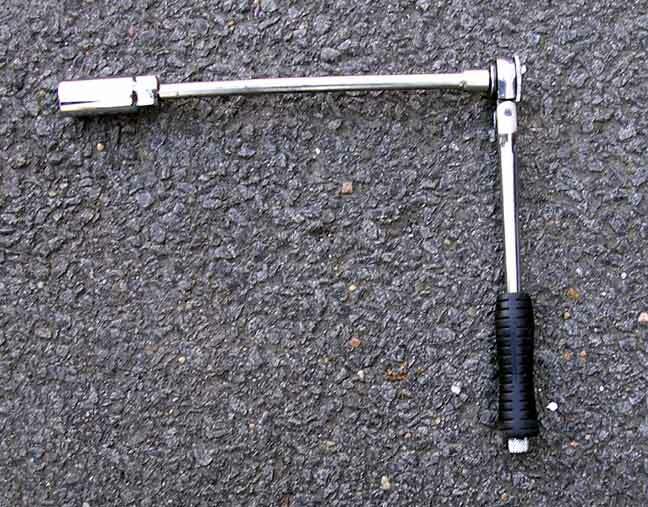 The tool I used to remove the front axel. It is a 22MM allen, and the back end of the spark plug socket was a perfect fit. Unfortunately the square drive hole wasnt punched all the way through, so I used a 10 extension to break it loose from the other side. I have heard the Craftsman 7/8 spark plug socket is also 22mm, and has the hole so you can put the extension through the socket, but this worked just fine. 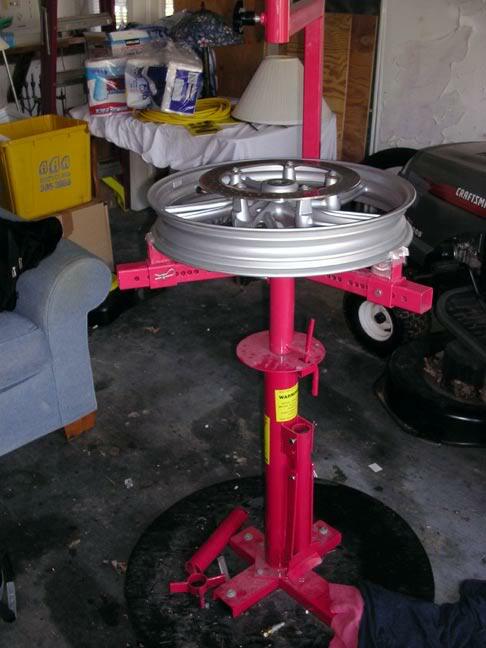 Using the bead breaker on the Harbor Freight tire changer. It works quite well, and very easily. 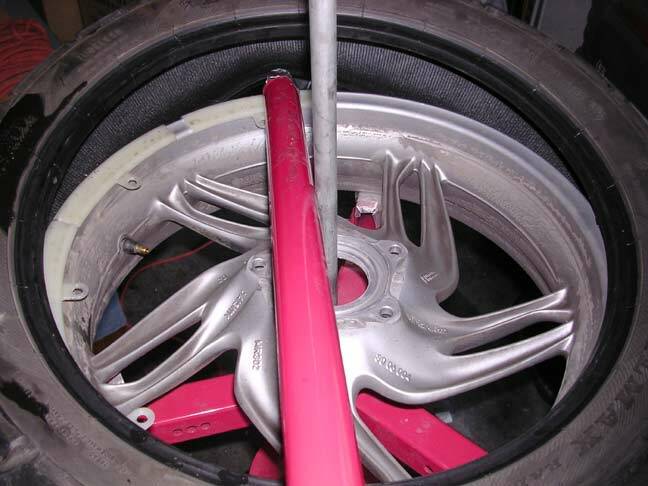 Setup for the tire removal tool includes clipping on the rim protectors. First pull the top edge of the tire off with the included tire bar. Then pull the inside of the tire off. Make sure the rim protectors dont slip out of place. 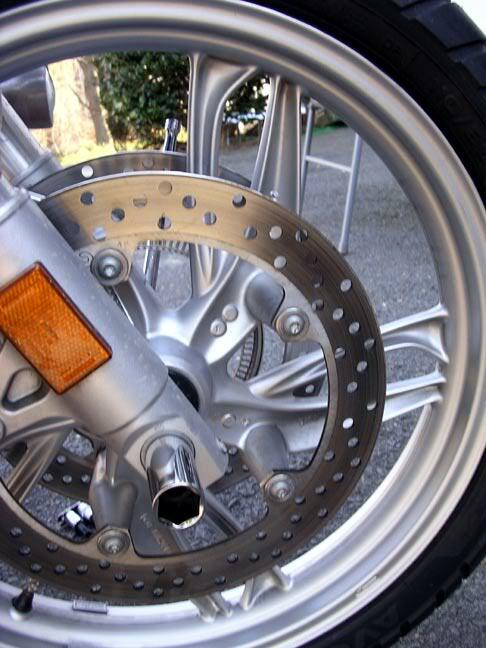 A view of the front rim on the changer. 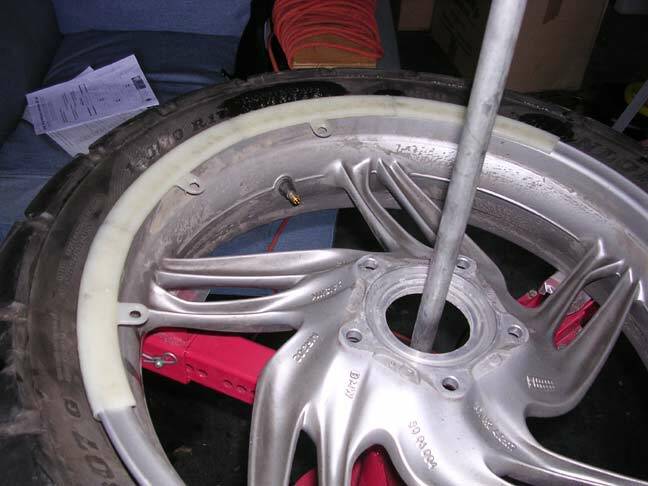 Note that I used nylon strips, held in place with packing tape in the groves where the rim is clamped in place. 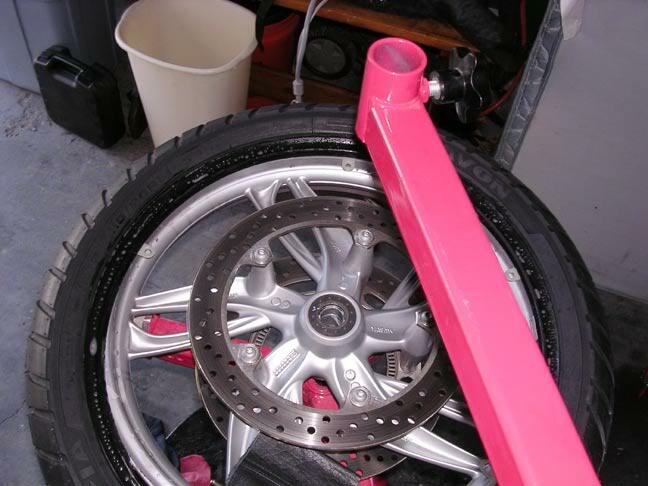 Soap up the tire and push it onto the rim. The bottom can simply be pushed on. The top requires a bit more work. I used Dawn dishwashing soap and a bit of water. 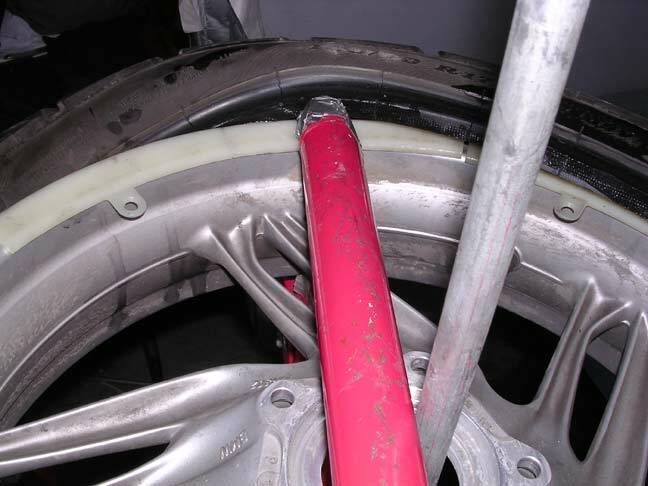 Here is a poor shot of the rim protectors spaced around the rim in anticipation of spooning the tire on. I use a Motion Pro 14 tapered spoon to do the levering, and a cheap 8 spoon to hold my place when I reposition. 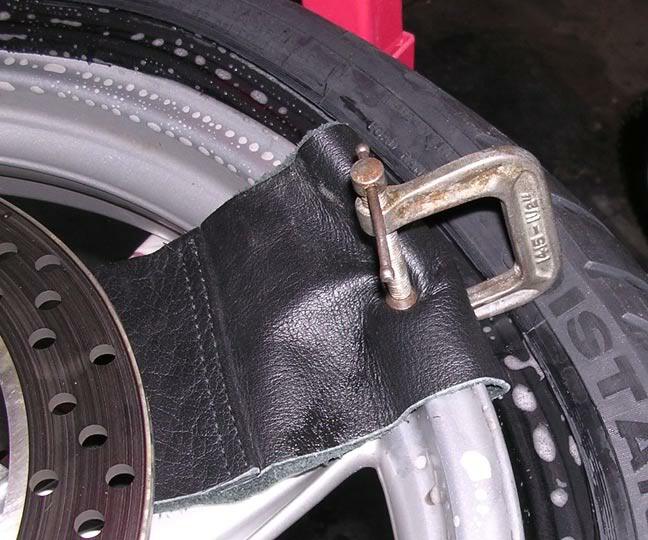 I use a small C-clamp and a bit of leather to prevent the tire from slipping off as I work my way around. Since my hands were full when spooning on the tire, I dont have any shots of that. But it is simple, and only takes a couple minutes. From start to finish, including rummaging around finding all my tools and needed parts, it only took me 2 hours to change my tires. Had this been my garage set up my way, it would have taken just over an hour. 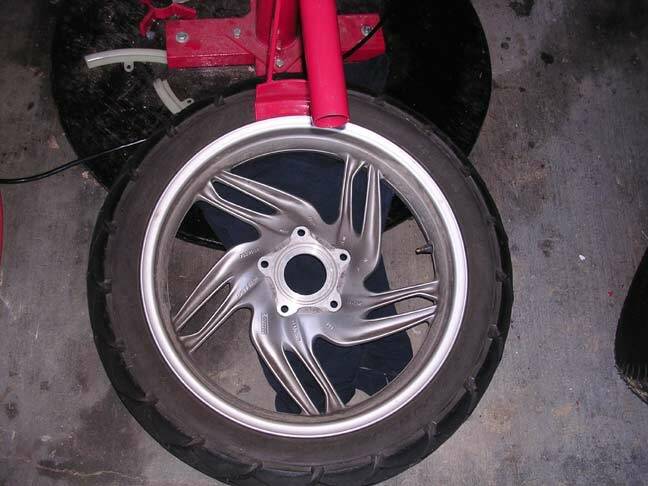 Actually removing and installing the tires on the rims took only about 10 minutes each. I spent a few minutes cleaning the rimes, and installed them back on the bike. See the label I couldnt get off? I also installed the new TourTech Beak cover. It was a bit of a disappointment since I had to oval the holes to make it fit, and the paint quality was not very good for $91. But I like the way it looks anyhow. Oh, and I took Ray back his Marc Parnes balancer, a 140 mile trip last night. 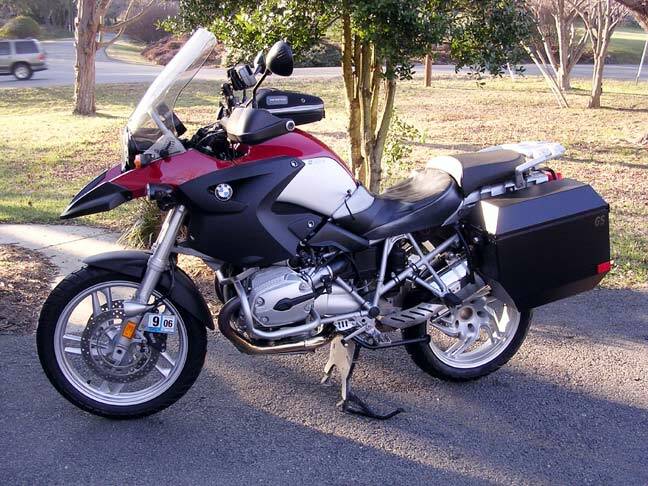 It rides very nice, smoother, quieter, and easier turn-in. I only have one complaint. I wasnt able to balance the rear wheel, and it might be off a tad. The 2 hole requires an adapter I didnt have for the balancer. Do you plan on getting the adapter so you can balance the rear? Can't thank you enough for posting these tech articles. I know how much I'll reference them during my own maintenance. As a side note as soon as I get my plates from NV I hope to be able to make it to a BMWBMW tech day/ meeting. I do, about the time I need a new set of tires. In a couple months! Hi Erik, Welcome to the club, and you are very welcome! Come join us next month in Poolsville MD for a tach day. See the www.bmwbmw.org/forum board for details. Probably one of the best (read: idiot proof) tire change write-ups I've seen. JVB: that's a nice looking setup for anchoring the HF changer. Some guys recommend epoxying threaded sleeves into their driveway, but yours is more portable. Is it an old tire filled with concrete? A couple more closeups of that setup would be much appreciated. Are you using the adhesive strip weights to balance? I'd like to use the rim clip weights, but would like to know a source for getting the ones specific for M/C use. Nice tutorial! Great post Jim, love the idea of the sparkplug socket, ingenius! Actually it is a 3' diameter table top I bolted it to. It holds the changer upright, and in place when I stand on it. Plus I can easily move it out of the way when I am done with it. 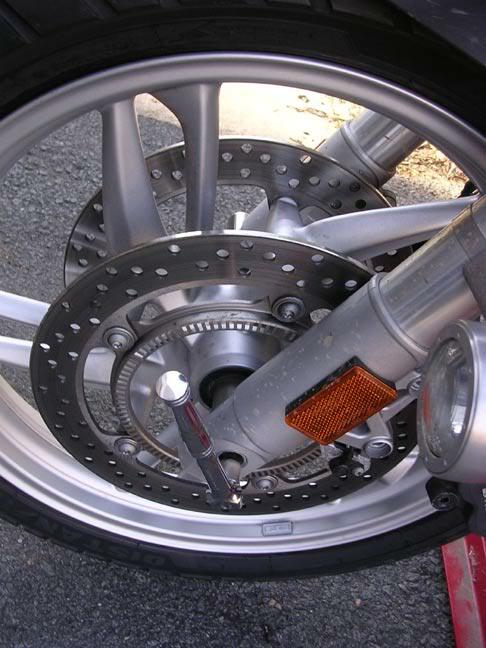 I had the Distanzias on my 11GS for a couple thousand miles before I sold it, and I really liked it on there. On the 12GS it is soooo much better than the Dunlop D607's. I actually replaced the front even though it was half worn. The rear was completely shot at 6700 miles. It went flat in the middle at about 2500 miles, and just kept getting worse. The steering was heavy, and the grip onroad was marginal at the edges. I was not comfortable really pushing it. Off road they plain sucked. Wallowing badly in gravel, and hard to keep a line. The Tourances I replaced on my 11GS had 14K miles on them, and probably another 1K left. The Avons on the 12 GS now should last 10K, I hope. I have only a couple hundred miles on them, but they really affected the handling. 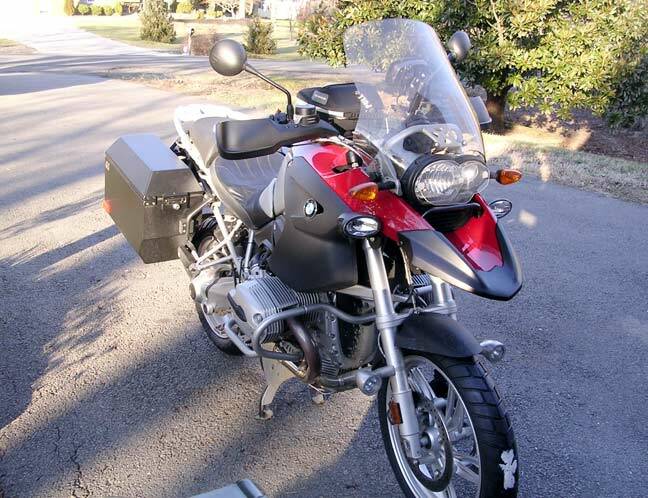 The steering is light and the bike feels much more nimble. They run smooth and quiet, despite not being able to balance the rear. Even not totally scrubbed in, they have a great feel to them, and stick well, even in 20° temps. I'll post more on them when I get some miles on them, especially in the dirt. So far, on road, they are at least as good as the Tourances, and I am hopping for off road and dirt they do better! PS Jon, what format would you like it in? I can do Word or Powerpoint. I can do Acrobat if needed too. Update on that. I found that a Craftsman 13/16" spark plug socket has the square hole all the way through, and you can use a short extension through the socket to remove the axel bolt. No need for the 10" extension, and torquing the axel bolt will be more acurate since you don't get the long extension twist. Great post Jim, I also found the sparkplug socket works well. Thanks for posting. I should have shown my socket on the extension like you did. You have more nerve than I having you bike supported like that. I am sure it is stable, but scarey looking. A 3' diameter table top that YOU bolted it to??? And it's not even a table top; just a round piece of plywood that I painted. Well, it was too much typing to say YOU bolted it to it, and YOU provided it. Looked like a table top to me. Besides, seems to me, you didn't give credit a few times either! Eric, who makes the sparkplug socket you used? I've tried a Craftsman and it's a tiny bit too big for the axle. Steve, I have 3 Craftsman Sparkplug sockets, and only one didn't fit. I believe it was a 13/16" socket, but an old one. The one I have now is a new 13/16" craftsman, and it fits nicely. Not snug enough to have to force it in, but with minimal play. PS I'll post a picture, and more detail of the one that didn't fit when I get home. I wanted something small that I could put in the tool bag under the seat, so I put this together. I used a 22mm clutch nut and a broken 3/8 extention. Welded the two together and ended up with a heavy duty axle nut that's less than an inch long.